Line 6, purveyor of modelling technology as seen in the POD series, is known for pushing the boundaries and its latest product, revealed on the first day of the 2014 NAMM show, certainly demonstrates that innovative streak, big time. While the company's claim to have reinvented the guitar amp may be a touch grandiose, it has certainly come up with something cross-genre and quite different - an amp designed for two very different roles... roles, however, that can be combined for extra practicality. While it is perfectly proportioned and powered (150 watts into a 12-inch Celestion) for onstage use, the AMPLIFi 150 has extremely clean lines that wouldn't look out of place in any modern living room which, of course, is the other side of the story... The AMPLIFi 150 is a stereo music player that has access to your music library wirelessly streamed via Bluetooth and reproduced through full-range speakers - a pair each of tweeters and mid-bass drivers. What this means is that you can listen to your favourite tracks and play along with them at the same time with no compromise in the quality of either guitar sound or music reproduction - an ingeniously designed volume knob lets you easily set the blend between the two. "You can listen to your favourite tracks and play along with them at the same time with no compromise in the quality of either guitar sound or music reproduction." 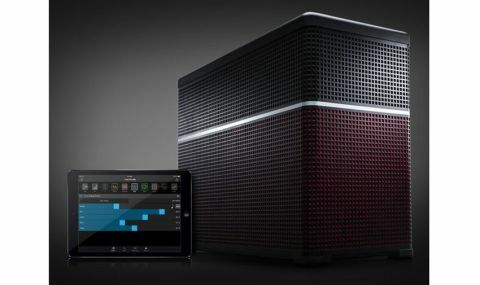 It is perfectly possible to use the AMPLIFi 150 without involving any extra hi-tech gear as it has four preset sounds onboard with a standard array of gain and tone knobs plus controls for FX and reverb, but to unlock the full potential you will need its accompanying iOS7 AMPLIFi app. This features a full editor and librarian for all of the amp's sounds as well as a music player with phrase training facilities that include half speed playback, looping and automatic tone matching. Using Line 6's now-familiar modelled sounds (over 200 of them), presets in the AMPLIFi 150 are made up of a signal chain that goes noisegate-wah-amp/cab-compressor-EQ-volume-modulation-delay-reverb, should you wish to use all of the elements. Of, course you can just have the amp sound. We used the app on an iPad and found it very easy to use, creating tones which were immediately loaded into the AMPLIFi sitting across the room. You have the facility to not only create a whole library of your own tones but also get new ones from the Cloud, uploaded by the Line 6 community - when you fire up the music player and play a song, an online search starts automatically to find an appropriate tone for it. In terms of sound, the AMPLIFi 150's music player is like a ghetto blaster on steroids, putting out enough volume to guarantee a visit from the environmental health officers should you be having a party in the wee small hours. As a guitar combo, it's plenty loud for gigging and features a practical and very playable range of modelled amps. It's the combination of the two, though, that makes the AMPLIFi 150 such a potent force. We all love to play along with our favourite songs and this is by far the most convenient way to do that yet invented. The Line 6 AMPLIFi 150 will be reviewed in Guitarist issue 379 (on sale 7 March).